Pair # 88 "The Man" & "JuJu"
“The Man” Champion Bird 2001 Old Birds Club and Concourse. As yearling in his first 8 races he was 1st 250 miles, 15 lofts 142 birds, 1st (equal) 275 miles 16 lofts 114 birds, 1st (equal) 110 miles, 6th 175 miles 220 birds 16 lofts, 5th 200 miles 135 birds 15 lofts, 6th 400 miles 127 birds 15 lofts, 6th 250 miles 142 birds 10 lofts, 7th 607 miles 125 birds 13 lofts. 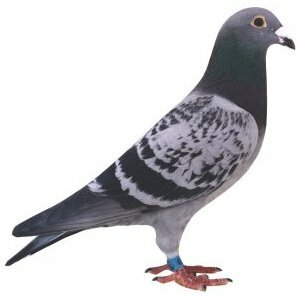 Sire “The One” and Dam “Pretty Lady” "Ju Ju" 1st Overall Ace Digest Pigeon 2002 young Birds. 1st California State Hall of Fame 10-25 Lofts 2002 Young Birds! This hen flew all 8 races scoring 6 equal 1st place. 1st 302mi (equal), 1st 232 mi (equal), 1st 265 mi (equal), 1st 185 mi (equal), 1st 232 mi (equal), 1st 185 mi (equal), 9th 150 mi, 19th 140 miles. 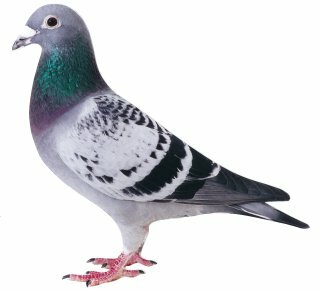 She is once in a lifetime pigeon! Sire is "Prince" and dam is "Mistress"!